A slow first half and a few costly miscues cost the Lady Bulldog soccer team Tuesday evening in their home opener against Class 6A Hobbs at the Mack Chase Athletic Complex. 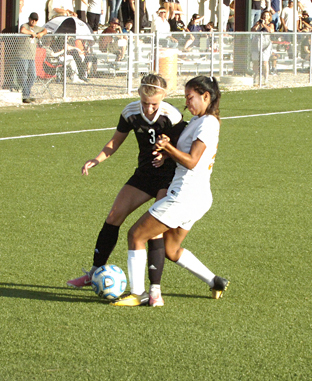 The Artesia girls struggled to put the Lady Eagles off their game in the opening 40 minutes, and the result was four goals that gave Hobbs the momentum en route to a 6-1 win. The Eagles launched 13 shots on goal in the first half Tuesday, and when the Lady ‘Dog D did secure what looked to be a stop, they were hard pressed to clear the ball, giving Hobbs multiple chances. Artesia was able to fight the Lady Eagles off through the first 11 minutes, but Hobbs logged its first goal with 28:45 on the clock on a shot that was blocked but squirted away and rolled over the goal line. The Lady Eagles’ next three goals – at 15:43, 12:01 and 10:20 respectively – were all either a direct or indirect result of balls that were left in the middle or bounced off of other players and landed in frustratingly perfect position for a point-blank shot. “The first half was just a really bad half for us,” said Trentham. “I thought we were being lazy across the board. We weren’t really working hard to stay in formation, we weren’t working hard to make sure we were helping one another out and covering for one another defensively, and we gave them too many opportunities to push the ball up our side of the field with a numbers advantage. Trentham and assistant Vanessa Lopez had a chat with their athletes at the break, and it had noticeable effects, as the girls in orange came out stronger for the final 40. With 30:16 on the clock, senior Elisa Cardenas sent a direct free kick sailing skillfully into the back of the net to make it 4-1, and the Lady Bulldogs did a better job of going toe to toe with Hobbs from there. The Lady Eagles were able to tack on two more in trash time, however, with 8:55 and 3:01 to go in the match. With the loss, the Lady ‘Dogs move to 3-1 on the season, and it’s a defeat Trentham feels likely came at a good time for his team. “It was kind of good to get our bubble burst a little bit,” said the coach. “I think we might have been a little too high on ourselves coming out of the tournament, and it was good to get back grounded. Artesia will have a week to prepare for its next outing at 6 p.m. Tuesday in Ruidoso, and Trentham says the focus will be on the little things that cost the squad against Hobbs. Following Tuesday’s matchup, the Lady Bulldogs will travel to Santa Fe Sept. 1 for a 6 p.m. bout with Capital before heading to Portales at 3 p.m. Sept. 9 for a rematch with the Ramettes. “We’re just going to get back to working on a lot of team stuff,” said Trentham. “We’re going to make sure we’re going at game speed in practice, work on our ball movement, transition and possession. Those are the things I think killed us a little bit in the game last night, because when we did have opportunities it was on transition, but we couldn’t capitalize on most of them.